Don't let your score get down because of objectives. Practice objectives with Prexam. SYJC Commerce Practice Free Test Series. Objective questions form a good amount of part in TyBcom Questions Papers. They help you increase your score as well. Excel the art of solving objective questions for TyBcom and get good grades. PREXAM practice questions and tests help you achieve this. Stay at par with what is happening around and excel at current affairs questions at your job interview and exams. Bank Exams, SSC, IAS, Railway Recruitment and more covered and updated to include latest happenings. Questions designed by subject experts and mentors with hints and more information with every answer to help you polish your knowledge. Take a Free CPT Practice Test And Find Your Rank In CA-CPT Exam Preparations. Sectional and Mock test on Mercantile Laws, Accounting, General Economics and Quantitative Aptitude. Try and score in each section to boost overall score in CA CPT exam. 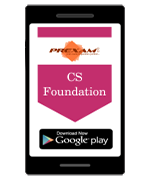 Prexam practice test for CA-CPT are based on Question bank of over 7,000+ Questions with latest updates designed by subject experts. Clear your concepts & learn essentials tricks to crack exams with Prexam Bank PO test series for IBPS, SBI and other bank recruitment exams. Prexam practice test for Banking Exam are based on Question bank of over 8,000+ Questions with latest updates designed by subject experts. Wants to crack JEE Mains & be a proud Engineer? Download Prexam App to smartly complement your preparation & stay ahead of others. Prexam test prep provides you with ample practice Material for engineering entrance exam mock test. Prexam practice test for JEE Mains are based on Question bank designed by subject experts. Preparing for NEET (National Eligibility Entrance Test) for UG Medical courses demands long hours of studies. Prexam help you cope with extensive syllabus of the entrances. Prexam test prep provides you with ample practice for NEET Exam. Prexam practice tests for NEET are based on Question bank of over 18,000+ Questions with latest updates designed by subject experts. Railway recruitment exams are extremely competitive. Lot of candidates appear for these exams from all over India. Prexam smart prepartion techniques help you stay ahead on the competitors and excel in the exams. Over 8000 questions to practice from designed by experts with details explanation on how to solve the questions. Staff Selection Commission(SSC) Exam Packages will help you boost your preparation and gain confidence to face the exam. Prexam practice test for SSC Exam are based on Question bank of over 9,000+ Questions with latest updates designed by subject experts. Prep analysis tool will help you understand which topics you need to improve on.